Fannie Mae waiting period guidelines after housing event depends on the type of housing event. Both Freddie Mac and Fannie Mae Waiting Period Guidelines have different requirements between short sale and deed in lieu versus standard foreclosure. Both Freddie Mac and Fannie Mae waiting period guidelines after housing event is longer than government loans. The Federal Housing Finance Agency (FHFA) is the government regulatory agency that monitors Fannie Mae and Freddie Mac and conforming loans. 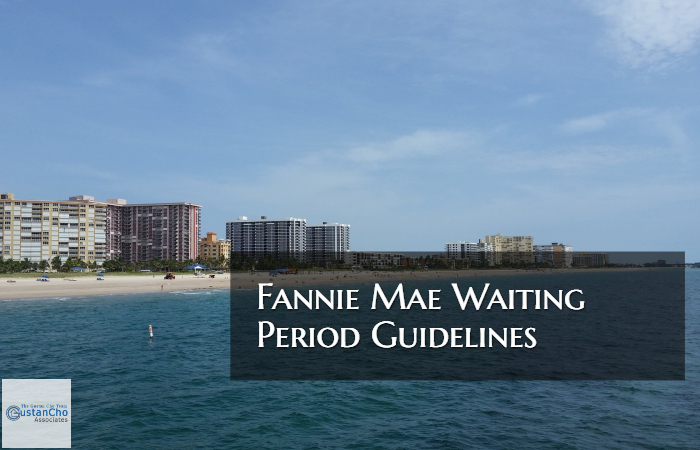 Fannie Mae waiting period guidelines do make an exception that a home buyer can qualify for a home purchase after 2 years after a short sale or deed in lieu of foreclosure if a home buyer with extenuating circumstances. Even though it is stated on the guidelines that extenuating circumstances such as an involuntary job loss and/or substantial loss of household income may shorten the waiting period, I have never seen a case where this happened. Do not count on going this route because the chances will be extremely tough. It will be up to the mortgage loan underwriter’s discretion and underwriters will not want to take that chance. The Gustan Cho Team now offers non-qm mortgages with no waiting period after housing event. Home Buyers can qualify for non-qm loans one day out of foreclosure, deed in lieu of foreclosure, short sale. 10% to 20% down payment is required. The amount of down payment depends on the borrowers’ credit scores. The great news with non-qm loans is that no private mortgage insurance is required. There are no loan limits like government and conventional loans. Non-QM Jumbo Mortgages are becoming increasingly popular. NON-QM Loans for self-employed borrowers do not require any income tax returns. 12 months bank statement deposits are averaged to determine borrowers monthly income. Up to 50% debt to income ratios allowed.